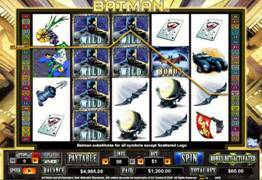 Batman... A beloved legend – an exciting Video Slot by Cryptologic, based on the 1930's DC Comics character. 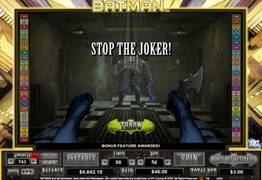 Batman is a 5 Reel, 4-Row, and 50 Payline online slot game with stunning bonus features and original graphics. The game opens with an animated scene of Batman and the Joker, thereafter including characters such as the Batmobile, Batsignal, Batcyle, Batwing Bang Flag, Commissioner Gordon, Acid Flower and the Joker card. The unique Bonus Bet Feature directs players to a secret bonus game. Coin denominations range from 1c up to $20. Batman also has an advanced Autoplay feature, where players can set the amount of spins. The speed can also be changed from regular to fast or very fast. This is great a great advantage for those that want play a lot of spins. Batman is the Wild symbol which appears on Reels 2, 3 and 4. Usually it appears as stacked wilds, sometimes on all 4 rows of the reel. The Batman Logo is the Scatter symbol, offering scatter payouts when 2 or more symbols appear from left to right. The simultaneous appearance of Commissioner Gordon on Reel 1, and the Batsignal on the 5th Reel will trigger the Batman Re-Spins feature. The existing winning combinations are paid first, then Reels 2, 3, and 4 will go blank and the Batsignal comes to rest on one of them. That reel will have expanding wilds for Re-Spins. This reel will then be held while the other reels spin 3 times. All payouts during the Re-Spins get doubled. This feature can be retriggered. The Bonus Bet feature will activate all 50 paylines, but wagers an additional 10 coins which will make the total bet 60 coins. There are certain advantages in return, such as an additional Batman wild symbol will randomly be added to Reels 2, 3 and 4. The scatter payouts will be multiplied by 50 and the line bet. The advantage is that the Descent into Madness feature gets unlocked by the Bonus Bet which is otherwise unavailable. This game offers non- stop action, well-known characters and high end technology. Players can join Batman in his Batmobile fighting his way through the inmates of Arkham Asylum trying to stop his enemy, The Joker.